Now that is A challenge ! Thankyou for breaking into your weekend break to satisfy us all. Although I sort of “bowed out” of the challenge because of time constraints, I am going to try something this month. This is actually a calming palette, and also one men are very comfortable with. Your thoughts about “stashes” are quite timely though. One’s stash really is about “possibilities,” and we are indeed fortunate these days to have them. Thank you Sharon for a new ( and not very easy) challenge. Pfew, this is a difficult one, but very interesting though…stories that are and that are possible…a rather positive thought, when you think of it! Any story can be positive if you want it to…I’ll come up with something, bu sure of that! Thank you Sharon!!! You have outdone yourself again!!! I do not get to post much, but my brain is usually thinking of something to do with this challenge or one of the others I am involved in. I’m hoping that inspiring thought will count—This months colors are —- a real challenge. Haven’t given the concept thought yet. Thanks for inspiring me to think outside the box. I didn’t get to the May challenge, but I think this one is doable. That’s a story that is possible in itself, eh? Thanks for the inspirations! Another month, another color shade chart posted to my blog – to freely share with everyone. These colors are very calm and I think I know what I’m going to do, but will get back to everyone later if the idea works. What a surprising picture for the challenge. Although I’m behind (not unusual for me) I’ve been thinking about the challenges and watching everyone’s progress. I’ve taken a few pictures lately that were just for the colors in the picture. Maybe they will turn into future CQ blocks. I probably wouldn’t have taken this picture myself – but it will be a challenge to use just these colors. I am back! I am still working on the Feb. challenge, put it aside, emotionally reached a difficult stagnation but am seeing it again with new light. March is done but not backed, however there is some replacement needed due to a catastrophe, as my cat ate the end of the wishbone I’d attached (A ture new version of the dog ate my homework)wo my husband is cooking a chicken this weekend to remedy the situation, I have all the April pieces ready and theme done and know what I want to do. May I am skipping for the obvious reasons of the last three. And well, I am adoring the June challenge wishfully thinking I can do something wiht this color scheme and theme as well. I’m itching with possibilities! I love the color palette and the theme! I instantly knew what I want to do. I plan to use both. I just have to figure out how. I am so enjoying this challenge; it has been such a good learning experience for me. Some thoughts come to mind immediately. Since I’m moving during June I’ll be doing something small and portable (another story in the making). And I think I’ll use stash items. Well I didn’t get the May challenge finished within the month but this is where you will find the result of my month’s thinking! ell I didn’t get the May challenge finished within the month but this is where you will find the result of my month’s thinking! ah stories… some one once said to me “if you learn to do anything learn to tell a story”. Since then I’ve been looking for stories… how to tell them is quite a challenge though. I am amused at seeing the word “possibilities” used here in reference to one’s stash. This is exactly why I named my feature article in Needlepoint Now (as well as my blog) “POSSIBILITIES!” Also – Emily Dickinson said “Dwell in Possibility” Having the art crazy quilters to inspire me, the possibilities are, indeed, endless for my little creations in needlepoint – so I feel rather justified in having this enormous hoard of fibers and beads, etc. In the last few months, my goal has been to use these things and not run to the LNS for more – quite a challenge!! I love it. I have been trying to find the source of this thread for sometime. I’d love to join. I will take the challenge, even if I am not Officially a member, tho. Love those sinks! I’ve blogged about my progress on May ( still needs some stitching) and my thoughts on June. I’m continuing what is turning into a theme on botanical labels – in this case a load of discarded metal tags and the stories they tell about the plants named. Just looking at those colors again – I see ANIMAL PRINTS in them. woooo hoooo. Cheetah, etc. Got to go dig in my stash and get to work. I love the theme and colors. I having been purging my “stash” for an artist garage sale, just to make room (for more?). My thoughts for this month and the finished May TIF are on my blog. This is a tough one Sharon! I just wrote my first post on this month’s concept. I also matched up the DMC floss colors to help others who are working the challenge. Thanks again Sharon for this challenge. It’s been interesting and more is becoming even more challenging! I’ve posted my first tangled thoughts on June on my blog. This one is so funny, as I’m also working on editing a novel I started. Talk about a story that is possible. Well I have pieced my block. It was easier than I thought 🙂 It’s on my blog now. Well May got away from me but I got my block pieced last night. My thoughts on June’s TIF are in my blog, and I pieced my block for June also. I love these colors and I love the theme idea! I’m still working on the May challenge and haven’t even taken photos yet but I’m excited to get to work on this one, too! I should have a little something there on this piece every day until it’s finished. I’ll be traveling, so the piece will tell a story as it travels with me. Well, I’ve come up with something, and started it with great pleasure, not finished yet, but I can show some of it on my blog together with my thought about the TIF June. Ever heard of the EUROPEAN SOCCER CHAMPIONSHIP? See my blog! Hi Sharon I have pieced my block this month a bit different to what I usually do and I am happy with it(I think). Leslie? Your link to your blog doesn’t work. Is it greasyming? I want to see yur Tif of may, too! very appropriate, that picture. I’ve just ordered a new kitchen sink! I just posted my May TIF piece, really enjoyed that challenge. I’m sorry, but I will be dropping out of the TIF challenge; I have to many activities and I am not getting on well enough with the weekly submissions… and I will be moving over June-July… too many things all at once. So I am making room for somebody with more time and inspiration. I have discovered many nice blogs thanks to this challenge and I hope some will keep on visiting mine. I think the article would be greatly improved by more images to exemplify the text. And your work with lace, buttons and silk embroidery is an excellent example. I can not include your pictures without your permission. I also want to begin a collection of crazy quilt images in the related site Wikimedia. 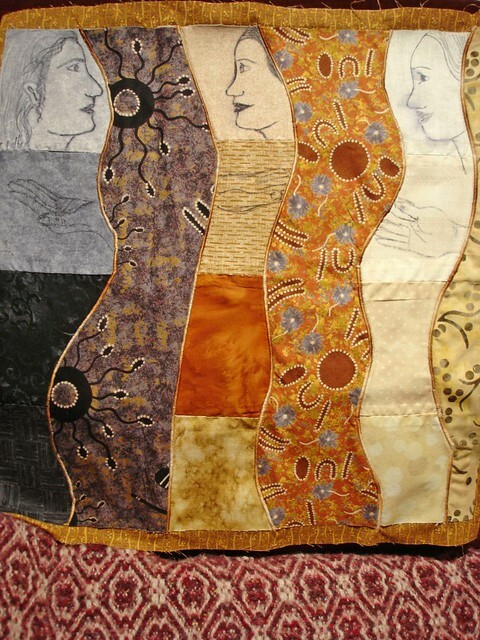 Currently, there are no images of crazy quilts on this site. Using the “sink colors” for June in a wedding pillow with needlepoint lace! Very elegant, indeed. Hi Sharon. My first thoughts on your June challenge are on my blog, hope to add more details in the next few days between other committments. Hoping to produce a finished textile piece for June, I seem to be manageing one every second month, VBG, at the moment. Hi girls: in this challenge i plan to use the color palette but not in floss, but, beads mill hill. I haven’t completed April and May challenges yet but I have first thoughts for June on my blog. Using the color palette, an homage to Ennio Morricone. Hi Everybody, I just posted my June quilt project to my blog. hope you enjoy. My June TIF challenge piece is done, and I also posted a picture of all six together. They’re on my blog if anyone wants to have a look! There have been some interesting pieces done already. I am feeling pleased that I have at last started my June TIF – I tried to add a comment at TIF page for May to say that I had put my second version of May TIF on my blog and onto Flickr. ‘Still working on it, though. Hi Sharon I have posted the next stage of my June block–I should have it done by the end of the week because I want a clean slate to start the Journal class. This months challenge should have been easy but for me this has been one of the hardest yet. I finally have preliminary thoughts up on my blog and a direction to go in. I put my first toughts about TIF on my blog, it is very hard to catch up after my holiday. So this month I am gonna make a small contribution. I am also having a GIVE AWAY on my blog if you would like to join! I have finally got my TIF for June on my blog, too much on at the moment to spend more time so I finished an unfinished piece that had the right colors and made it a bit bigger so it is now the same size as my other pages. The colours are more or less right and I added shells, buttons and beads as part of my stash of collectables. Unfortunately, I will not be making anything for the June challenge. I am having problems with my hands and am having a hard time finishing the May challenge. It will get finished though. I’m afraid I missed out on May’s challenge due to other commitments, but I hope to do it before long. I’m going to combine 2 challenges this time and I shall use the embellisher to use some of my fast growing stash of fabrics and fibres suitable for felting. I have added a few thoughts on stashes on Digital Gran just now. I have on my blog a new design for the TIF June. I used the palette for this month. I hope you like. Kind regards. Completed June TIF full details on my blog. I’m finished, too. This was a fun challenge, thanks, Sharon. I’ve finished my April TIF piece which you can find on my blog along with my initial thoughts for the June TIF. A wealth of stash is security as well as convenience and inspiration. I have only just begun!! I have also finished my June challenge. I combined it with work I was doing for my Embellisher class because it used lot of bits from my very large stash. I have posted a photo of two bookmarks that I am using as my June TIF piece. Coincidentially the colours were almost those of this month, so inspite of the best intentions to use the concept – the colours won. I have also finished my June challenge. I used my embellisher. I’ve started embellishing May’s block and I’ve pieced June’s. I’m enjoying the stitching. The color schemes are taking me off in some new directions. I changed my mind about the initial ideas I had for June’s TIF , basing it instead on the discovery of an embroidery my Mother made over 30 years ago,of a place I visited recently, using some of the same design sources and threads as she did. Hi Sharon, my June block is complete and I just posted about it on my blog. Thank you again for this challenge. It is definitely become interesting! My May and June challenge pieces are both posted on the Take It Further blog, as well as on my personal blog. Very different techniques, but I enjoyed doing both of them. Here is my WIP for June, very rough and may start over if you visit my Flicker site you’ll see what I’m up to. It’s titled “Stories that are and stories that are possibilities-three sisters” I hope this link works if not I’ve posted the pictures in the Take It Further Flickr group pool. I have been finished with my piece for a while now, but it was a gift so I had to wait until now to post about it…Hope you like it as much as Camas did! Hi Sharon I have finally finished my June block–I tried a different arrangement this month because I knew I would be pushed for time but it proved to be more difficult. Not enough seams to embroider and too much space that I found hard to fill in a way that would all blend together. Ah well we live and learn don’t we. My June TIF is complete – that was fun Sharon – I loved the theme and the colours. Now to get ready for all the things I have planned for July. The story behind the stitching is on my blog – http://maggies-textiles.optusnet.com.au. I’ve posted a piece for June. It isn’t what I initially started, but there you go. Hopefully I’ll get some inspiration and finish the other one. Looking forward to the journal class. Maybe that will help me focus on the end result before I start. I used the palette again, but also a lot of things FROM my various stashes. I’m very pleased that the year is half over and I’m all caught up with TIF – that’s much better than I did with TAST. I have posted my thoughts and my June piece on my blog. I don’t feel I have extended myself this month as I have had so much on that I couldn’t give enough to the challenge but I have participated. I just finished and posted mine. I made a very simple project. I’m dropping out of the challenge. Sorry! Life is too busy and difficult at the moment. Just updated my blog with the June challenge. There are still some secrets, but they will be revealed shortly. Sharon, have updated my blog with some thoughts. Alas, no completed project again, but I hope you’ll accept my Stash Stories in verbal form this month. Will try to post some photos of said stash as soon as I work out how to upload from my DD’s camera, my own has finally died. I’m getting close to being finished with June. You can see the progress at http://justenoughtime.wordpress.com. I just posted my June piece on my blog. Looking forward to next months challenge! I’ve completed my June piece. If you’d like to take a look it’s on my blog http://ruthsfiberphotos.blogspot.com or on the TIF blog. Thanks! well I made it … 10.30pm on the 30th June and I have finished for the month. I have posted a picture on the flickr group web page. I’ve uploaded my challenge piece to flickr. I started out the month with one idea, sketched it out and worked out fabric and colors. And then something else fell in my lap, like kismet and I had to follow that idea instead. It’s just a small piece but you know how it is when something’s bugging you, and you can’t concentrate on anything else until you start working on it and then once you start you have to finish it! I just posted my June piece. I decided to use this subject because it some what matched the color pallet and I felt it was a good subject. i enjoyed trying some new techniques also. Opps! I forgot to give my blog address. This is my first attempt at the TIF challenge. I found it very meaningful as I worked on the stash/story angle rather than the color scheme. I love challenges like this, so fun to see how everyone interprets them. Yes, I finished it! My tif june. It was a story in a story to tell you the truth. It’s the story of our soccerplayers during the European Soccer Championship. Come an see my orange blocks!!! It was fun again!!! I’ve finished my June TIF, just a touch late. The finished piece is at http://justenoughtime.wordpress.com on July 1. On to July…. I finished my TIF June, this one was really hard!!! I am still working on my June TIF. I am afraid my ideas always end up taking more time than I have. Sorry to be so slow! I have finally finished my piece also. I am still working on it & will probably be done this week or early next. here are links to the 2 pictures. Well a couple of days late and not bound but close to done. See Bonita’s comment for links. I have finally posted my June TIF on my blog, I was actually finished on time but didn’t get around to bloggling till today, I know, I’m bad but I promise to get on the stick faster this month. I just posted a picture of my June and May finished TIF projects. I made eyeglass cases out of both of them. Finally got around to putting a comment here to announce that I did indeed finish the June TIFC! Well, maybe Donna will feel better that she’s not the very last one to do June’s TIF. Mine is finished as of October(!) and is posted on the flickr site. Look for a magpie (bird).